Firestone Walker makes some pretty outstanding American craft beers. Just like many other craft brewers, their sought after beers are their annual releases of their bourbon aged beers. Even tougher to get, it seems, are their anniversary beers, which are a blend of several other beers into one tasty liquid behemoth. 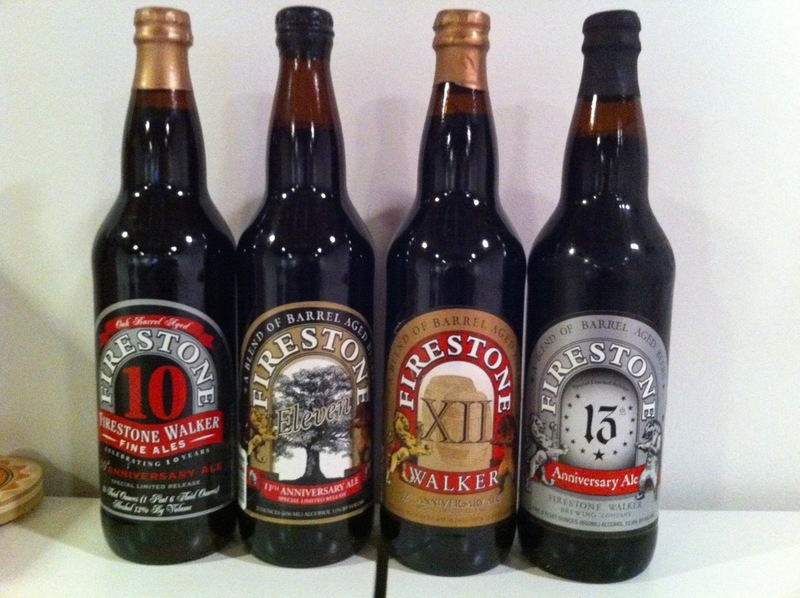 Via the Tuesday Night Beer Club (TNBC) the group put together a vertical of 10, 11, 12, and 13 of the anniversary series. One of the cool parts of this series is that Firestone includes a list of the beers that were blended and the percentage. And, from what I understand, at least the last few years they have invited local wine tasters to come and taste the different blends to help in deciding which blend will be the final for that year. Unfortunately I didn’t take notes; I wanted to enjoy the beers for what they were, uninterrupted. Just pure indulgence. I will have to say that 11 and 12 were the boldest of the group and, for me, that is a good thing. 10 and 11 were tasted together. I thought 11 was the better of the two on the first night. The second round was 12 and 13. 13 was damn smooth for its age, but 12 was bold and bourbon abounded, making me likey. 🙂 Overall I would rate as follows: 12, 11, 10, then 13. The only regret of the four beers: we had them over two different get together’s that spanned 30 days in between. I would definitely recommend these fine beers to anyone that enjoys bourbon aged beer/blends. Enjoy! This entry was posted on Tuesday, November 2nd, 2010 at 7:48 pm	and is filed under Beer. You can follow any responses to this entry through the RSS 2.0 feed. Both comments and pings are currently closed.